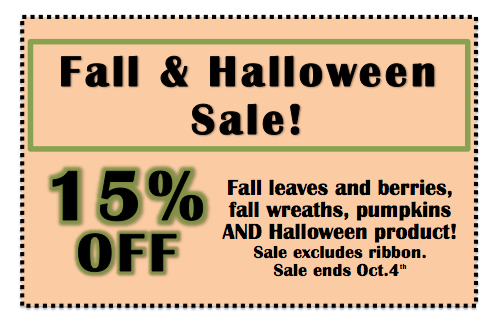 Fall/Halloween sale here at DFC! Only 2 weeks! Good Morning! Today is the official first day of Autumn! It also marks the first day of our new sale! 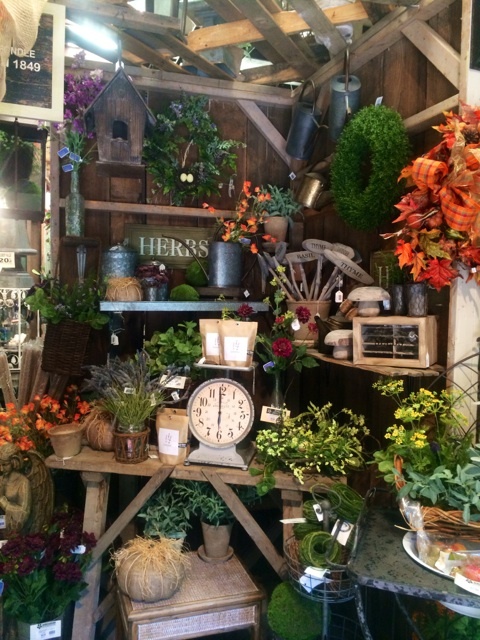 Get your home or business in the fall spirit! 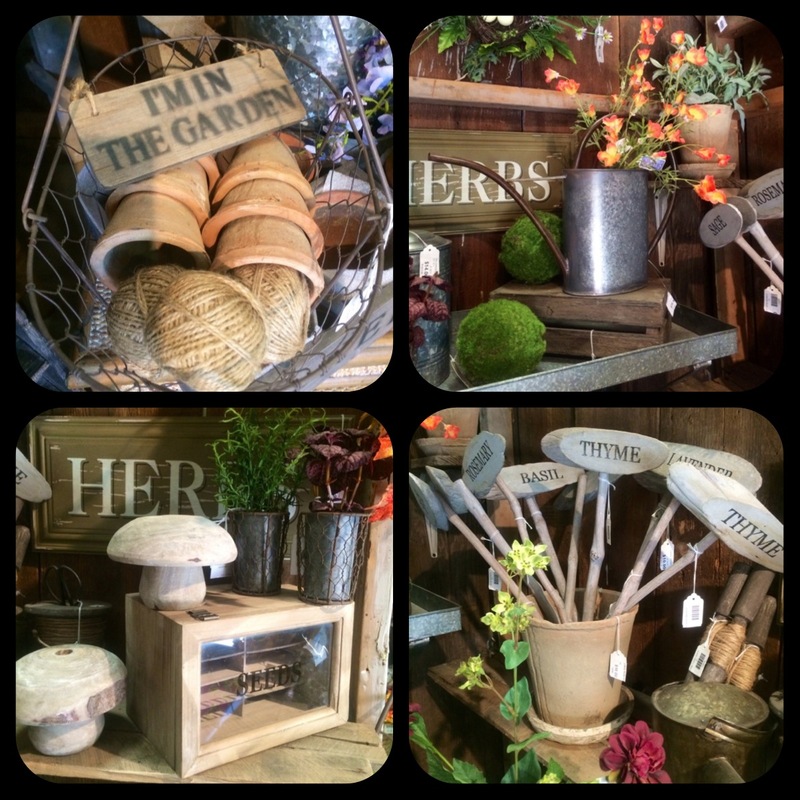 We have some really great items that will spruce up any area! You may also want to get a jump start on your “tablescape” for Thanksgiving! and don’t forget, Halloween is also on sale here at DFC until Oct. 4th! 15% OFF! 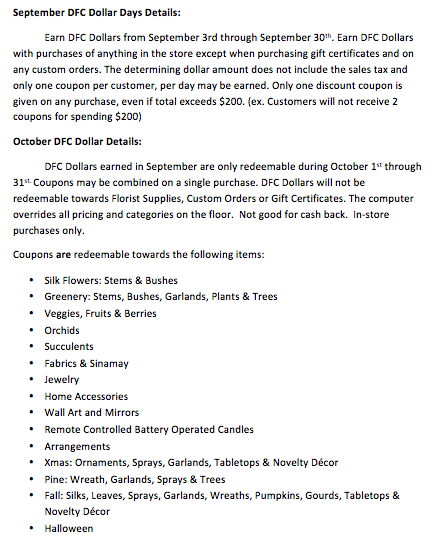 Also, all month long when you shop with DFC you can earn DFC dollars to be spent in the month of October! Potter’s Shed Sale! One week only! If you or someone you know has not been in to Designer Flower Center to see all the amazing changes we have made this year, you must come in and check it out! 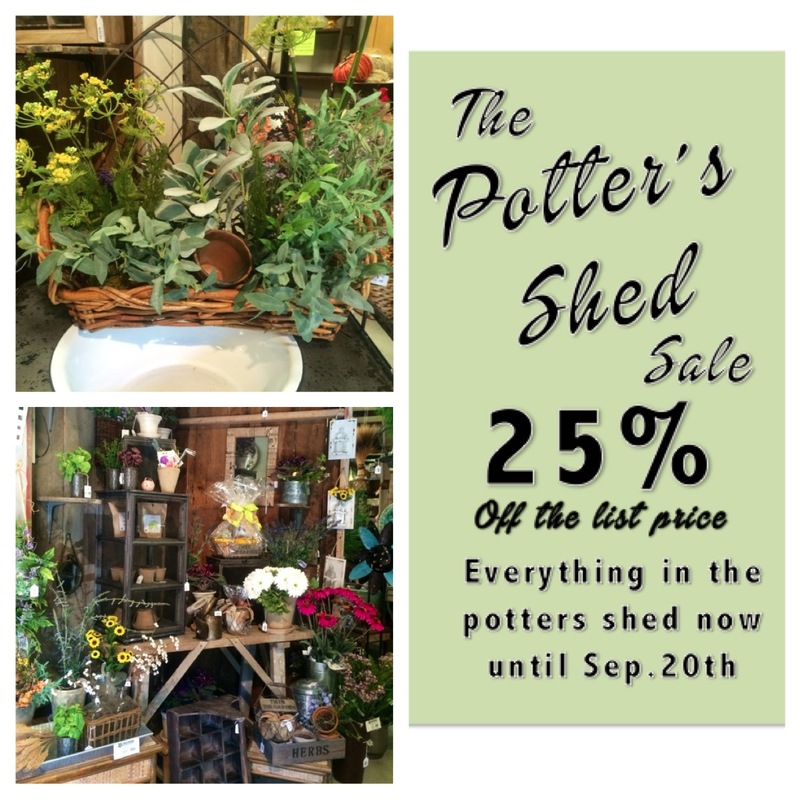 As a bonus, right now when you shop at DFC you will receive 25% off the list price on a wide variety of garden items in our Potter’s Shed Sale. 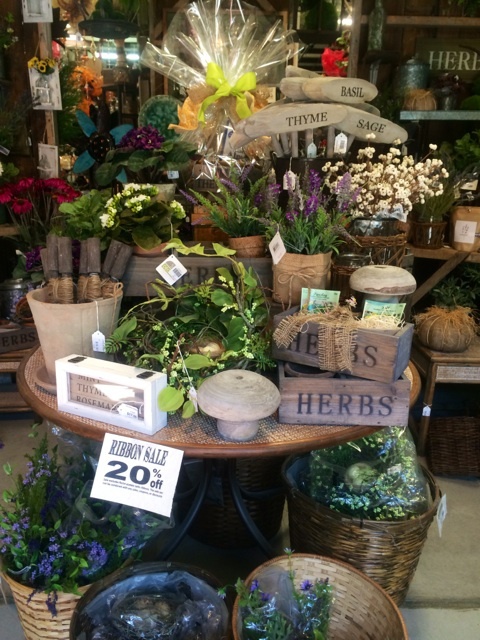 Choose from silk herb plants, bushes, watering cans, herb signs, herb boxes, herb plant stakes, wire baskets, the old wooden cart, and so much more! Don’t miss this incredible sale! 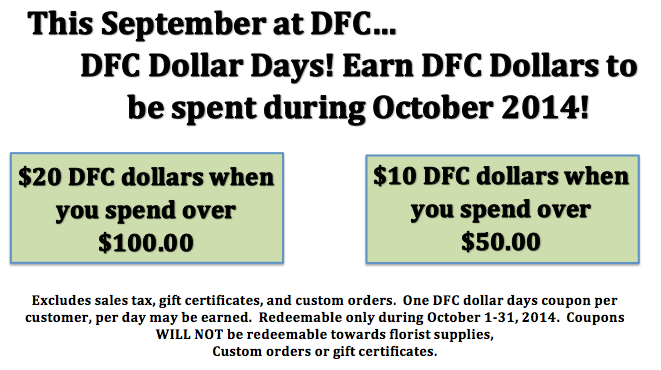 September DFC Dollar days are back! We are SO excited to announce that we have brought back DFC Dollar days for September! 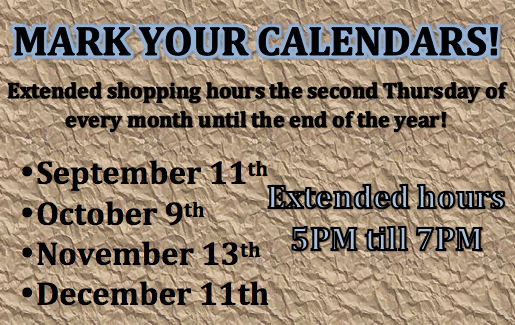 Come on in and shop the whole month of September and earn DFC dollars! When you earn DFC dollars you can spend them in the month of October! Hurry in for this great promotion! It’s one you wont want to miss! Hello September -Sales & Events! Good Morning and Hello September! Can you believe 2014 is almost over?! wow! This year is going by so fast, It seems like just yesterday we were having our grand re-opening event and bringing in all our new Park Hill product! Time sure does fly when your having fun! Mark your calendars! 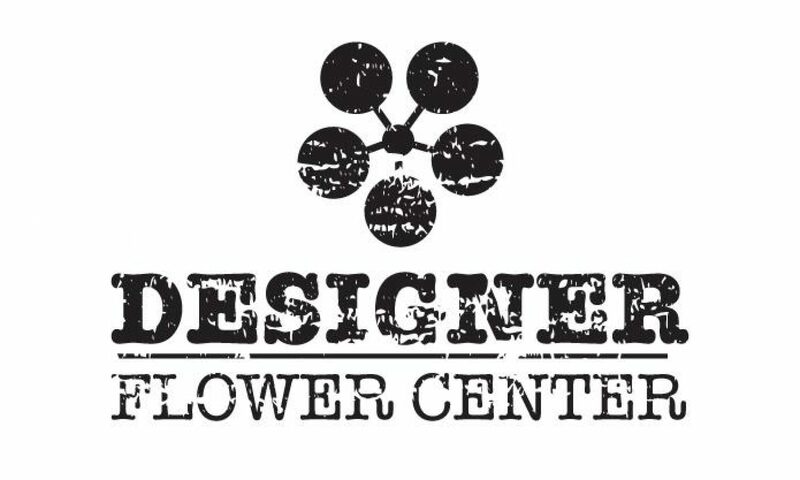 Designer Flower center will have extended hours the second thursday of every month for the rest of the year for your shopping convenience and so you can get a more personal shopping experience full of unique items and creative ideas! Designer Flower Center wants to Thank YOU so much for shopping local and supporting “mom and pop” shops. We have unique and one of a kind items that you can’t get anywhere else and displays in our store that will take your breath away! Thank YOU! Our sale to kick off September is always a popular one! Ribbon! Ribbon is always great to keep on hand. It has just about a million uses! and they are great for any party theme! We have such a huge variety of ribbon at such amazing prices! DFC ribbons have 10-50yards on each bolt! We even have some ribbons that are 100 yards per bolt! We have returned to regular hours!